You will never feel more magical than when encircled by this trio of butterflies. 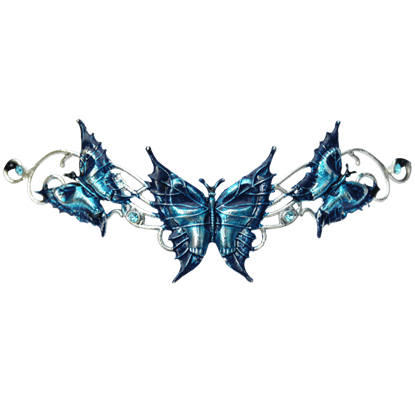 The versatile Blue Butterfly Hengeband can be worn as either a circlet or a necklace, the perfect fantasy accessory for any ethereal outfit. Flaunt off your passionate spirit with our Bright Heart Hengeband. 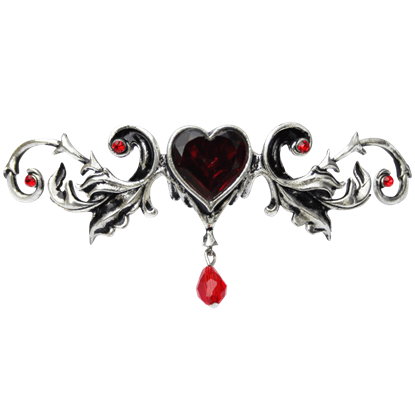 A versatile accessory, this jewelry piece features a red heart at its center while each side of the heart is adorned by silvery leaf filigree and matching gems. With mountains of superstitions and folklore about them, it is no wonder that black cats are so popular. 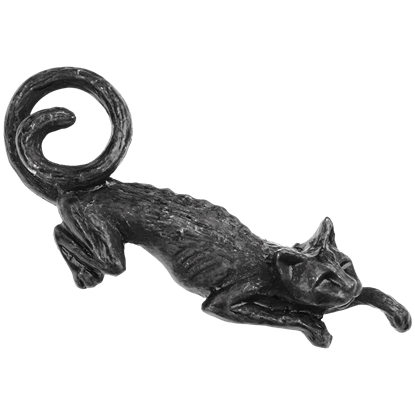 Known to the Celts as the Cat Sith, black cats like the one in the Cat Sith Hair Slide were considered a type of fairy. Adorned on each side by elegant, outstretched fairy wings and twin crescent moons, a light blue jewel sits at the center of our Fairy Moon Hengeband. 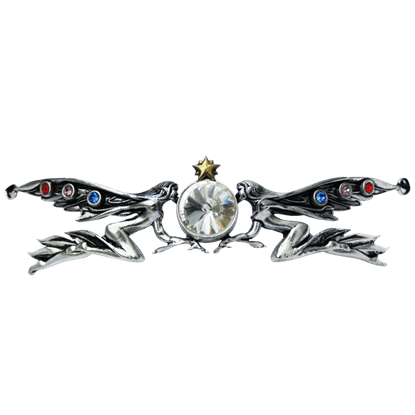 A versatile piece of fantasy jewelry, wear it as a regal circlet or necklace. Embrace the magic of fairies with our Fairy Star Hengeband. A delicate circlet or necklace, this piece of fantasy jewelry depicts two serene fairies with colorful gems in their wings flanking either side of a bright white crystal. 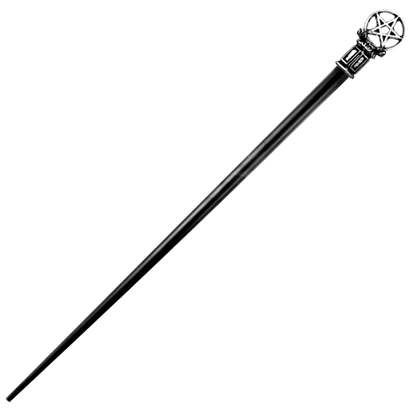 The Roseus Pentagram Hair Stick is for Alchemical perfection, particularly when it comes to beauty. The top of this hair stick is made from fine English pewter and would look stunning upon your lovely lady's head. 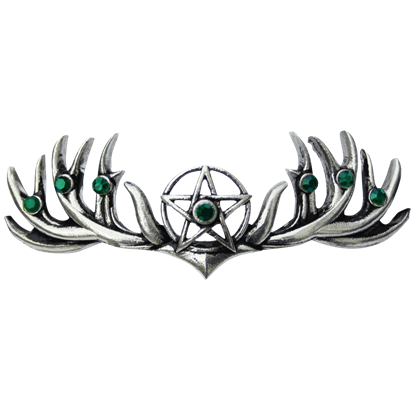 Equip our Spirit of the Forest Hengeband to channel the energy of the mighty stag. This versatile accessory can be worn in a variety of ways, making it an excellent gift or an elegant statement piece in any enchanting ensemble. Adorn your beauty with our Spring Hare Hengeband. 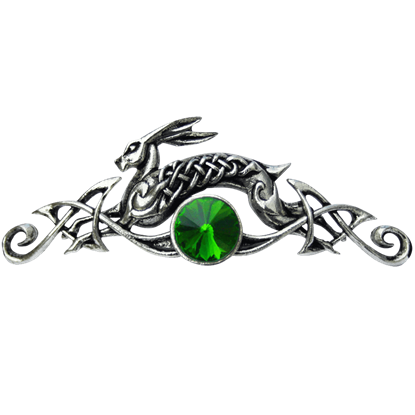 Made of pewter, this silvery jewelry piece displays a lively hare leaping over a bright green jewel, its body ornately decorated and surrounded by Celtic designs. Add elegance and romance to any look with our Unity Rose Hengeband. 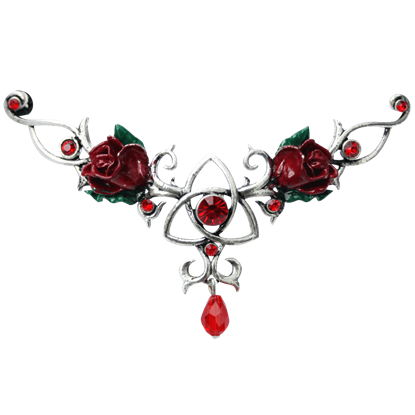 Deep red roses and jewels adorn a Celtic Trinity knot in this highly detailed and versatile piece of jewelry. 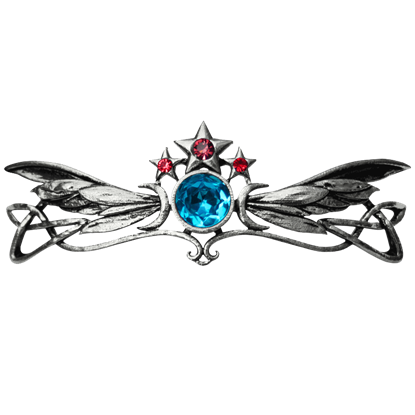 Wear it as either a circlet or a necklace. The order shipped so fast that I could hardly believe it arrived when it did. And it was a custom request, no less. The belt is perfectly sized and the bottles are very authentic in their design. This is unreal service - thanks!